TVS Motor Company has rolled out the 50,000th unit of the BMW 310cc series motorcycle from its Hosur plant. The bike, a BMW G310 R roadster was rolled out in the presence of Dr Markus Schramm, Head of BMW Motorrad, and KN Radhakrishnan, Director & CEO, TVS Motor Company. 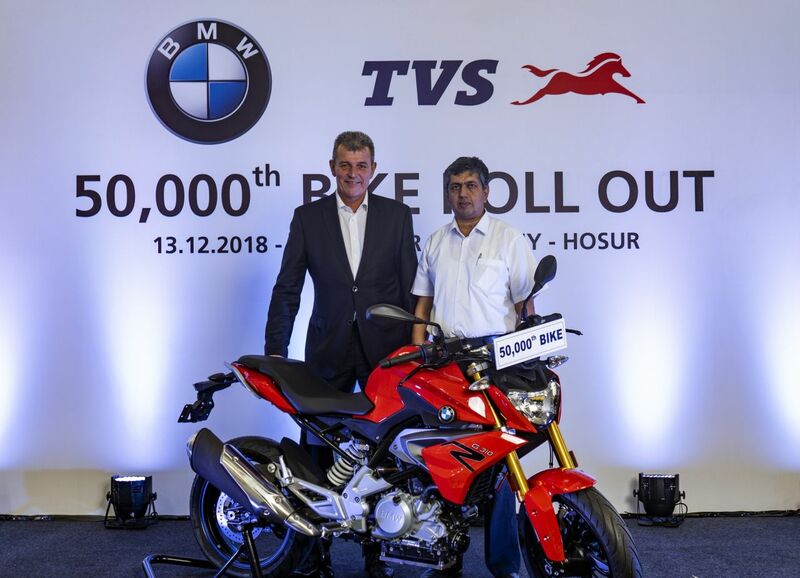 The 50,000th motorcycle, a BMW G310 R (Pictured) was rolled out in the presence of Dr Markus Schramm, Head of BMW Motorrad (Left), and KN Radhakrishnan, Director & CEO, TVS Motor Company (Right). Today is a significant milestone in our journey with BMW Motorrad. Over the course of this six-year partnership, we have had an opportunity to create a common learning platform for both the companies resulting in the creation of aspirational products for the global market. It is heartening to see BMW’s foray into sub 500cc segment meet with positive response across the globe. We are delighted to be a part of this success story. TVS Motor Company and BMW Motorrad signed a long-term strategic partnership to manufacture sub-500cc motorcycles for the globe in April 2013. This collaboration has resulted in the launch of three products on the 310cc platform namely BMW G310 R, BMW G310 GS and TVS Apache RR 310. The exports for the two BMW Motorrad models commenced in December 2016. The motorcycles are exported to more than 90 countries. Six years back, we took a crucial step with the decision to enter into the sub 500cc category in partnership with TVS Motor Company. In them, we found a perfect partner who have always stood for high quality and technology. We are delighted that we are rolling out the 50,000 unit of our 310 series motorcycles in less than two years. This reaffirms our decision to offer BMW Motorrad quality-led premium products for the sub 500cc segment. 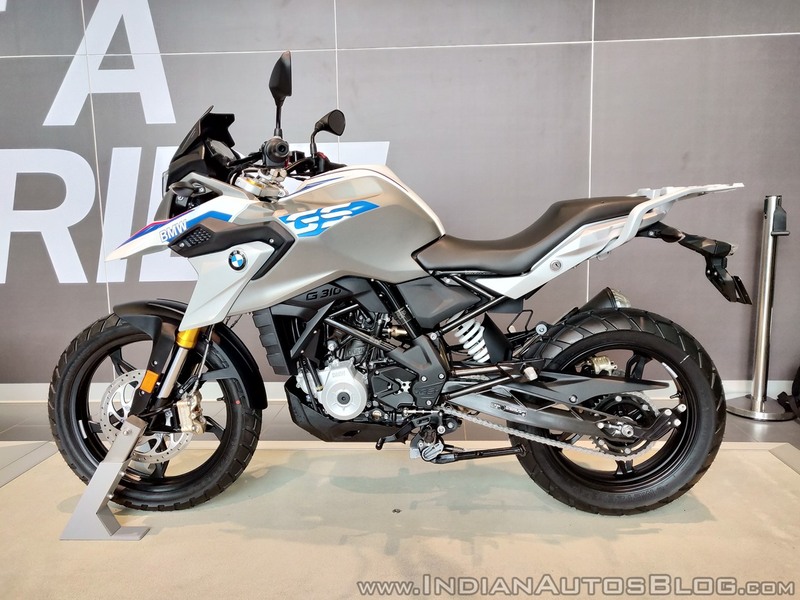 The collaboration between BMW Motorrad and TVS Motor Company has resulted in the launch of three products - BMW G310 R, BMW G310 GS (Pictured) and TVS Apache RR 310. In India, the BMW G 310 GS retails at INR 3.49 lakh, while the G 310 R is available for INR 2.99 lakh (ex-showroom Delhi). Both motorcycles use a reverse-inclined 313.2cc, single-cylinder, liquid-cooled motor that churns out 34 hp of maximum power and 28 Nm of peak torque. The engine is mated to a 6-speed transmission.